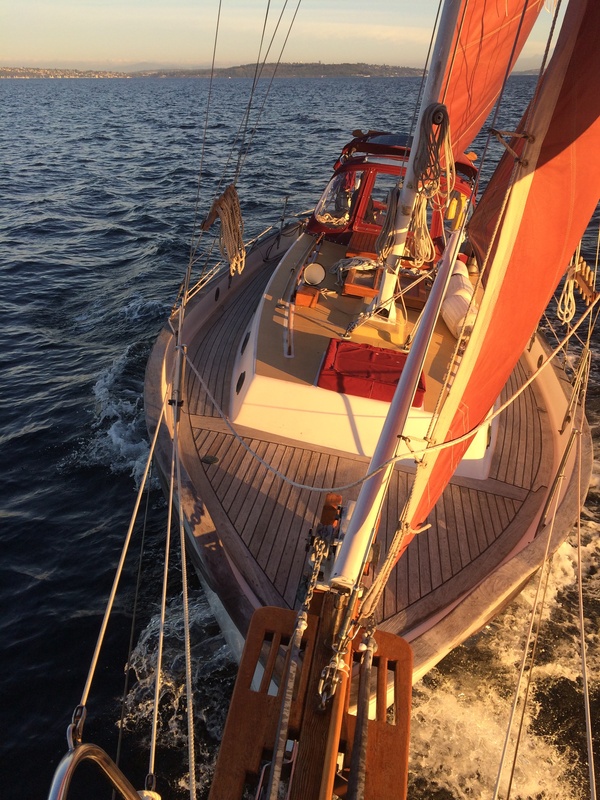 During the summer friends and family usually get their chance to go for a sunset sail in the calm weather aboard Satori. There are six lifejackets on board and there has been up to seven people crowding the deck. This is when the water is almost flat and the winds are somewhere between five and ten knots. We may even heave-to and dive in to cool off for a bit. It’s summer and we love it, but for Satori it’s not quite right. Her sails are not full and she isn’t really going anywhere. She only gets a moment to spread her wings but not enough to really stretch out. Enter fall. This is when storms brew and the low pressure brings stronger winds from the south. Sometimes we can get a fresh breeze from the north, which can be consistent and requires a little more effort to keep the helm balanced. Too much mainsail and the tiller starts to load, not enough and she will not close-haul into the wind effectively. The ideal points of sail is thirty degrees to wind from port, all the way around to thirty degrees to wind from starboard. That is three-hundred degrees of range. Satori has more like 240 degrees of range because I do not have a symmetrical spinnaker and pole on board. 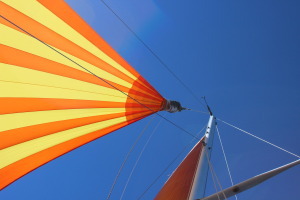 If the winds range from fifteen to twenty knots, the sail plan can be confusing. Shall I reef or keep her full? Can I fly the spinnaker or should I just use the jib? Not reefing and getting hit by a twenty-five knot gust can shake me a little when being close-hauled. Flying the spinnaker risks causing the boat to head up, the sail to deflate and then shock loading the sheet blocks when it catches wind again. Temperatures can also be challenging. If the sun is out but the winds are blowing, one moment you’re freezing and another you’re over heating. Do I put on my foulies or what? The best part of fall is having solitude on the water. No one is interested in sailing because it’s likely to be cold, rainy or both. The days are shorter so we may sail in the dark. There is probably some chop, bigger swell and more uncomfortable at certain points of sail. Although my friends and family may not like it, both Satori and I define sailing by these measures. I’m learning, pushing the boat, keeping her in control, and likely the only sailing boat out there. 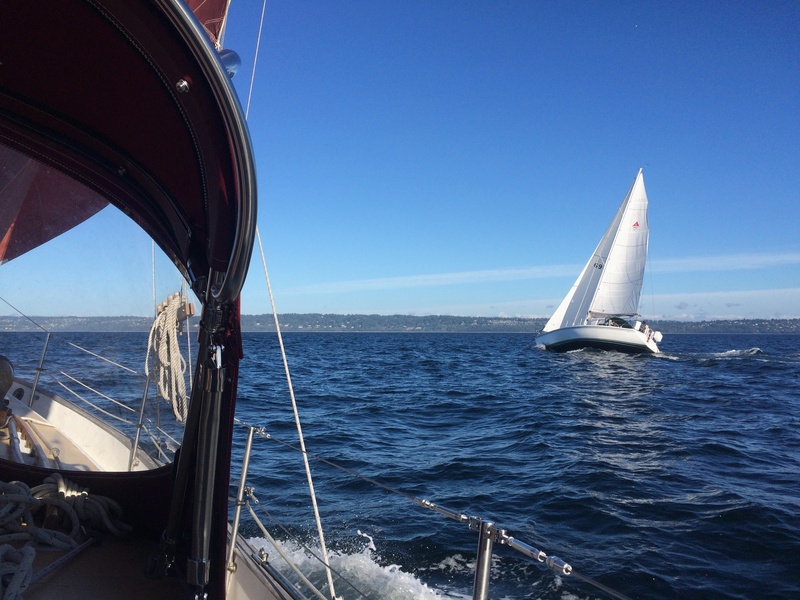 Yesterday I took her out for a cruise with a seaworthy friend and it was much better sailing than all of summer. Not only did we hit twenty knots of wind but I actually had to reef in the main so we could sail to weather without the rudder having so much force. In retrospect, I think only one reef would have sufficed but I also wanted to see what two reefs felt like. I’ve never needed that much reduction and I learned that the main needs to be balanced properly to sail to weather. Otherwise I cannot reach high enough to make headway against the wind. Double reef without enough wind and Satori cannot stay as close hauled as a single reef or a full mainsail. I also wanted to do a sea trial on the new spinnaker arrangement yesterday. The tack is now run to the cockpit through stanchion blocks and fairleads. The sheets are smaller diameter dyneema core and long enough to do an outside jibe. I have a new halyard block in front of the forestay, which is also mounted on a dyneema pennant. Testing the new arrangement just meant having enough wind to comfortably jibe without causing any issues. The new sheet blocks were lashed to the hawse pipes temporarily. It worked well but I did not like the way the blocks were rigged. I decided this morning to finally make my first dyneema soft shackle to arrange the sheet blocks to attach to the hawse pipes using a loop that is held in place using the stanchion from the boom gallows. The primary reason for all of this is to be able to setup the entire spinnaker tackle but also take it all down when it’s not in use, aside from the fairleads. The position for the new loops are perfect and I will just use another small set of soft shackles to connect the blocks to the loops. Aside from thru-bolting another anchor to the rail, this is the best system I could come up with to setup a spinnaker sheeting system that holds the sheets further back than the jib sheet blocks. I could probably pick up the boat with these loops. Our first outside jibe was a little bit scary. I should have been more specific to my friend about the sheeting position once we came about. The winds were about ten to fifteen knots and gusting. The spinnaker was filling and deflating, which caused some shock load on the sheet block. Finally I commanded to sheet in until the spinnaker no longer deflated, which solved the issue. It’s nice to know now that I can run the spinnaker from the cockpit, adjusting both the tack and clew without having to go forward. I just need lighter winds to practice the jibe and hit the correct sheeting angle to catch the spinnaker without having the issue of it deflating and catching. If the winds picked up and I was not sheeted properly, that could cause enough shock load to shatter the sheet block. Fall began on September, 23rd and everything around feels like fall. The rains began and fell hard last week. I am arranging my cold and wet weather cycling clothing so I can ride to work in the soup. I even bought a new heater to take the chill off the morning and evenings and keep the boat dry. 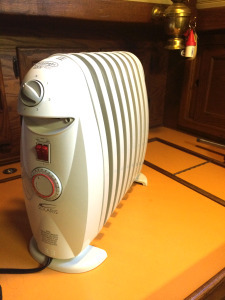 I do not like the sound of fans running so I bought an oil heater, which has been nice so far. With the combination of the Dickinson stove I think Satori will be fine to live on for the winter. I still have a couple of additions to assist with keeping the draft out and that will come soon enough, when there is a demand for it. I am also going to fix the Dickinson stove and try to get the water coil running into the hot water tank so I am not using as much electricity to heat the water. Finally, I am adding a variable speed resistor so I can lower the fan speed while the flame is at it’s lowest setting. I need a little draft to keep the smoke from getting pushed back down in windy weather but not too much where the stove is too hot. While I’m working on the stove, I have this little helper keeping the us warm. Since I took up sailboat ownership I discovered the level of innovation with UHMWPE has been remarkable in the sailing world. I did not know that my background in rock and alpine climbing would pave the way into utilizing the same dynamic and static systems used for fall protection. There are four factors that are almost exactly the same between climbing and sailing: weight, friction, force and mechanical advantage. While mechanical advantage is generally only used in rescue scenarios and big-wall gear hauling, it is still a requirement if you plan to voluntarily or involuntarily explore these scenarios. When hauling gear and climbing ropes instead of rock, you must use a static line. When setting anchors into rock for fall protection, the system is designed to accept a static and directional load. I learned how to safely and quickly install equalized anchors using aluminum carabiners to connect the static anchors to a dynamic rope, thus reducing the shock-load on the anchor and on my fragile body. I also learned about the materials that are commonly used for static loads. 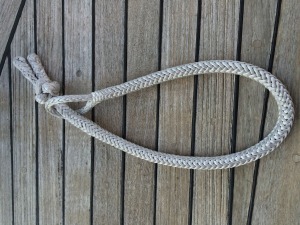 The legendary Fred Beckey once shopped around used clothing stores to find silk neck ties, which would be used as the connection between the anchor carabiner and the climbing rope carabiner. They would provide the strength needed, without any sort of factory testing to prevent a fatal fall. 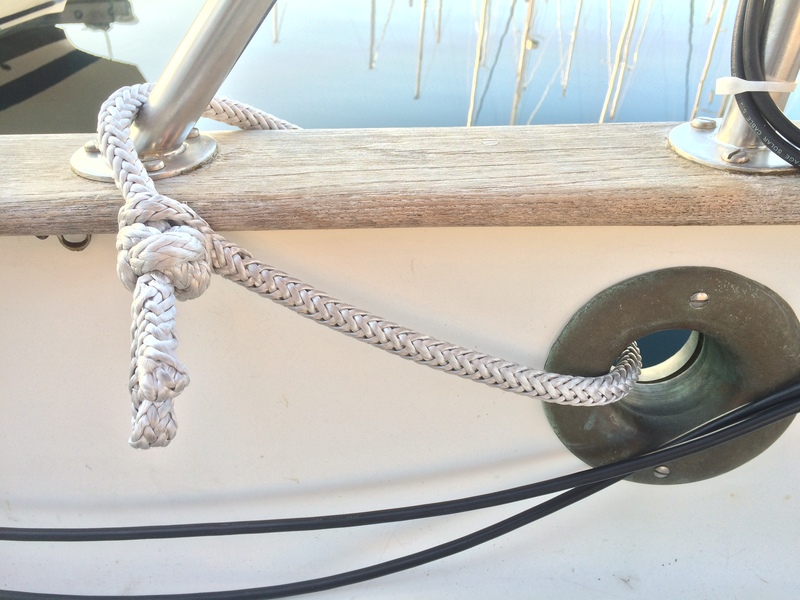 Today we still use the same concept of a strong and static loop to connect a dynamic rope to an anchor but now are using sewn dyneema slings. They are highly abrasion resistant and stronger than any necktie ever was. The weight savings for being able to move fast and light over difficult terrain is greater than ever. Now looking at sailing and the invent of dyneema, I am seeing a very similar change in how we look at our systems. Sailboat racing has provided the innovation, since they would rather have as little weight as possible with the strongest systems available to them within a reasonable cost. 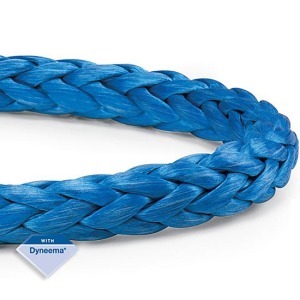 So we gain weight, strength, durability and cost advantages by choosing dyneema over 316 marine grade steel. Steel does last longer when exposed to the sun but it weighs considerably more than dyneema when comparing strengths. The verdict is still out on which would actually last longer as a structural component, exposed to the weather. Does ultraviolet radiation cause more damage than corrosion with respect to the strength of the material? The cost for steel is much, much higher than the cost for dyneema when comparing strengths. Now durability plays differently with both materials. Steel is rigid while dyneema is highly flexible. Where one may be an advantage, the other may be a disadvantage. It really depends on the situation. 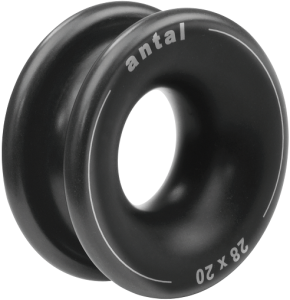 The first two systems I would like to discuss are the concept of soft shackle and the concept of low-friction blocks. Both are fairly new and have sprung up as a replacement for their steel counterparts. Soft shackles are simply a spliced piece of dyneema which can be opened and closed securely but would serve the same purpose as a steel shackle. The difference is where length comes into play. A soft shackle can be made to various lengths to make the application much more custom to the task, whereas steel is manufactured to fit a single purpose. Granted, steel is made for much more custom situations, like turnbuckles and swivels. Steel can be bolted to provide a structural anchor point, whereas dyneema would not be suited for this application. Low-friction blocks are a much cheaper and modern way of providing a mechanical advantage over blocks with bearing assisted sheaves. The cost is significantly cheaper and the system is much more simple overall. There is a limit to the application, mainly because you are left to manufacture your own block system using only dyneema line and low-friction rings. The most common applications are barber haulers, fairleads and running backstays. I’ve seen some diagrams of how a low-friction ring 8:1 advantage would be setup, but few examples in real world scenarios and the result is more like 3.3:1 from what Allen has tested at L-36. People tend to be slow with trying something new and the cost of failure could be fairly catastrophic since failures are likely to be at a higher load point. A boom vang probably wouldn’t be an issue but a mainsheet block system could be disastrous. I took Satori on a weekend tour to Everett this weekend. I’ve never been there except when I was a kid I remember going to places like Hat Island, the Jetty and spent many days of summer on the waterfront in Mukilteo. I wanted to sail without worrying about other people so I took a friend along and sailed some of the way. I was able to get the sails up and stay close to the wind until a few miles south of Whidbey Island’s Possession Point. At one point Satori was doing a little over four knots on a close haul with a nice heel. Once the winds died near Possession Point I motored through Possession Sound and parked on the inside part of the guest dock at the Everett Marina. A couple of people I know from being guests at Shilshole flagged me down and suggested I stay the night next to their boat. I invited them over for beers while they ogled Satori’s interior. The next morning I motored past Mukilteo, right around where the winds died the day before. Tons of fishing boats were heading north for a fishing derby. I might have passed five hundred in a matter of hours. It’s tough to tell. I learned a few things about my setup. First off, I need pad-eyes for the tack line that are mounted on the stanchions. The line is not routed at all. I also need some sheet blocks further back, with a straight line to the winch. I also checked out the masthead on Friday night and found a place I can install a halyard block for the spinnaker so I can gybe the sail outside of the forestay. I also need some dedicated sheets that are plenty long enough to run both sides. The existing ones are just the jib sheets and are a little bit too short. I could use another twenty feet total. So to have a solid working spinnaker I need to buy more line and hardware. This will be worth it when I am sailing downwind in the trade-winds. I could see Satori sailing at six knots easy with twenty to twenty-five knots of wind. It would be nice be be able to gybe without having to snuff the sail every time to clear the forestays and also have more control over the routing of the tack line.